You’ve experienced this if you’ve followed a story, whether cinematic or literary. In Back to the Future, a woman hands Marty McFly a “Save the Clock Tower” flyer. That exchange foreshadows things to come. If you’ve seen the movie, you know exactly what I mean. If you haven’t, well, you’re on your own, Bubba. These thoughts about foreshadowing bounce around in my head because of two specific reasons. 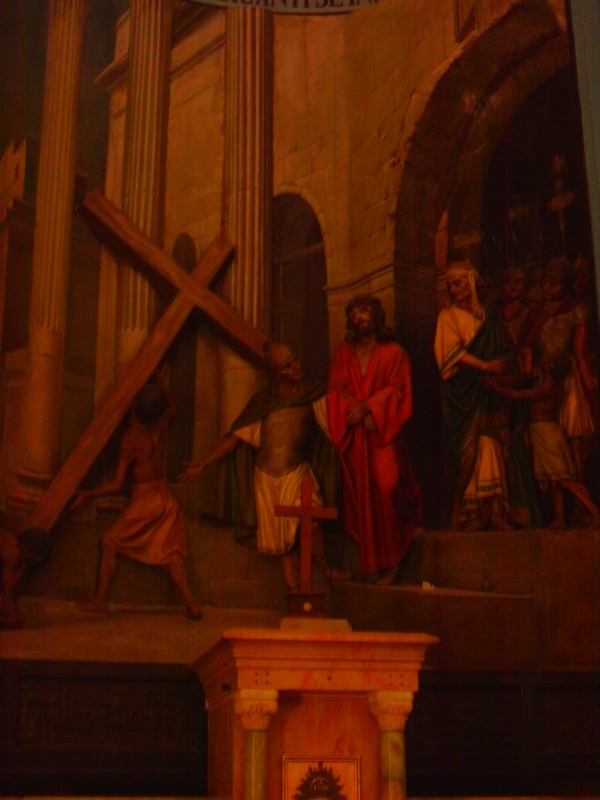 Chapel in Jerusalem along the Via Dolorosa. 1) The time. This week has been filled with the activities of Holy Week—Palm Sunday, Maundy Thursday, Good Friday, and, still to come at this writing, Resurrection Day (which sounds tons better than Easter—you of course may disagree). 2) My reading. For a week now, my early morning readings have included the Psalms. When I read Psalm 22, I marveled at the foreshadowing of the cross over a thousand years before the event. King David, ruling from 1010 to 970 B.C.E., wrote, “My God, my God, why have you forsaken me?” (Psalm 22:1 NIV). Does the line sound familiar? Matthew records, “About three in the afternoon Jesus cried out in a loud voice, ‘Eli, Eli, lema sabachthani?’ (which means ‘My God, my God, why have you forsaken me?’)” (Matthew 27:46 NIV). Later in the Psalm, David writes, “… they pierce my hands and my feet. All my bones are on display; people stare and gloat over me. They divide my clothes among them and cast lots for my garment” (Psalm 22:16b-18 NIV). Matthew writes, “When they had crucified him, they divided up his clothes by casting lots” (Matthew 27:35 NIV). So, in this Holy Week, I’m very aware of Scripture, God’s foreshadowing of past events, and what the two mean for us today. For me, certain truths emerge. 1) God spoke/speaks through people. God foreshadowed future events, the crucifixion for one, through a shepherd king and others like David long before any of the events took place. Matthew notes ancient prophetic utterances throughout his Gospel as indicators of the nature and work of Jesus Christ. One of the themes of Scripture, and one that emerges in my novel Dark Eyes, Deep Eyes, is how God speaks through ordinary people under ordinary circumstances. What was true in David’s time is also true in ours. God speaks through people. 2) Events did not/do not surprise God. Whether for good or ill, events often shape us. At times, we crumble during a crisis. But, the crucifixion, the horrific slaughter of an innocent Man, neither caught God by surprise nor caused Him to collapse under its crushing weight. What was true in Matthew’s time is also true in ours. Events in our lives do not surprise God. These thoughts, simple as they are, foreshadow something I’m still processing. I hope to write more on this my next post. I’m curious. Where has God captured your attention during this past Holy week? 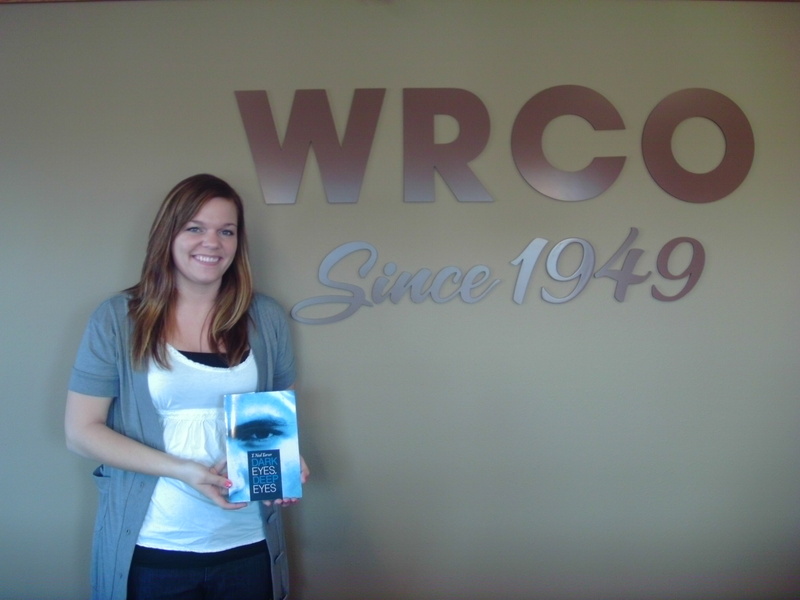 “Dark Eyes, Deep Eyes” goes to the local radio station and meets Sarah. This entry was posted in Special Days and tagged Back to the Future, crucifixion, Easter, Foreshadowing, God, Prophesy, Resurrection. Bookmark the permalink. God has captured my attention with a look back this week. I have been thinking about different ways I have spent Easter, especially the times not spent in my home church. Still not sure where these thoughts are going, but I know God is leading them somewhere. My Sunday Reflections post on Monday will likely reflect this journey. I really enjoyed your take on forshadowing, and I look forward to reading your book soon. And now I’m curious about Sunday’s reflections. I’ll have to check out your post on Monday. Concerning the book, there is definitely foreshadowing in it. I hope you enjoy it. So far, the reviews from friends and other readers have been very positive. A friend’s wife asked him, “What if I don’t like it? What will I tell Tom?” She liked it. But even if you don’t, it’s okay. I’d love to hear from you anyway, Kari. God bless, happy Resurrection Day, and good reading. Your book is on my “to read” list. I’ve gotten out of a regular routine of reading, and I need to get back at it. I’m a happier person and a better writing if I take the time to read every day. Tom, I had the opportunity to go to the Secret Church simulcast Friday night. You can read more about “Secret Church” at the site, but very simply it was 6-7 hours of straight Bible teaching about suffering and the cross. From 7pm to 2am, David Platt taught about how suffering throughout Scripture points to the cross and what that means for a believer. I cannot even summarize it here, but I do strongly recommend it! You can download this one, and the many other sessions, at the website and watch them (or listen) on your own time. I do this during my lunch hour at times. Anyway, I came away with a much better understanding and perspective of suffering the victory of today! Happy Resurrection Day! Thanks for the link, Chris. I’ll check it out. Resurrection Day went well. The whole span from Thursday evening through Sunday went well and blessed my soul. Friday night I saw God’s desire for community alive and well among my brothers and sisters in Christ as 19 area churches gathered to worship together at the community Good Friday service. Something intriguing is happening in our little community and it’s like reading a good book (can’t wait to turn the page) but better because it’s real life.